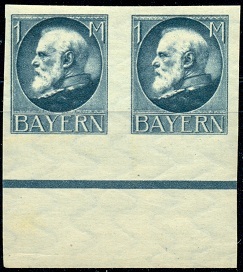 During 1919, huge sets of Bavarian stamps of the Ludwig III design were issued, both perforated and imperforate, with surcharges, with overprints for the People's Republic, and with overprints for the Republic. One could correctly assume that with all these overprinted stamps, some of the sheets would leave the printing plant with missing overprints. In most cases, the stamps with missing overprints, would be impossible to tell from the same denominations issued without overprints between 1912 and 1916. There are exceptions though, and these varieties are highly sought after by specialists. There are two denominations of the "Volksstaat Bayern" set of Bavarian stamps that were never issued as unoverprinted stamps. They are the 35 Pf. in orange and the 75 Pf. in red brown. These two denominations, without the overprint, are errors and collectible varieties. The missing overprint varieties of these two denominations exist both perforated and imperforate. The 35 Pf. is the scarcer of the two perforated varieties, and the 75 Pf. is the scarcer of the two imperforate varieties. A pair of the imperforate 35 Pf. is shown above (Mi. #134 B I, Sc. #164a). 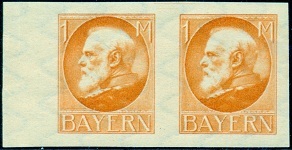 There is only one denomination of the "Freistaat Bayern" set that was never issued without the overprint. It is the 75 Pf. in olive bister. This denomination, without the overprint, exists only in the imperforate set. It is an error and a collectible variety. An image of the imperforate 75 Pf. denomination is shown above (Mi. #146 F, Sc. #223a). There are some other collectible overprint varieties of this set, as well. The 3 Pf. perforated stamp and the 10 Pf. imperforate stamp can be collected in pairs, with one of the stamps missing the overprint. Among them are double overprints, inverted overprints, and partial overprints to be found on other denominations of this series. At the end of 1919, Bavarian 1 Mk. 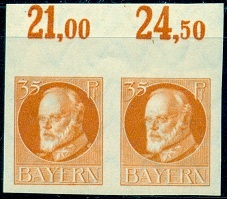 stamps of the Ludwig III design were printed in new colors, overprinted "Freistaat Bayern", and surcharged with new values. They were issued both perforated and imperforate, and they are the 1.25 Mk. on 1 Mk. yellow green, the 1.50 Mk. on 1 Mk. orange, and the 2.50 Mk. on 1 Mk. gray. Imperforate missing overprint stamps of this issue, as they are in unique colors, are errors and collectible varieties. Pairs of the imperforate orange and gray one Mark stamps are shown in the images above (Mi. #174 B I, #176 B I, Sc. #235a-36a). The imperforate yellow green stamp, with the missing overprint / surcharge, is very scarce. Both the perforated and imperforate stamps also exist with surcharges and missing overprints, with misplaced surcharges and overprints, and with double surcharges and overprints.